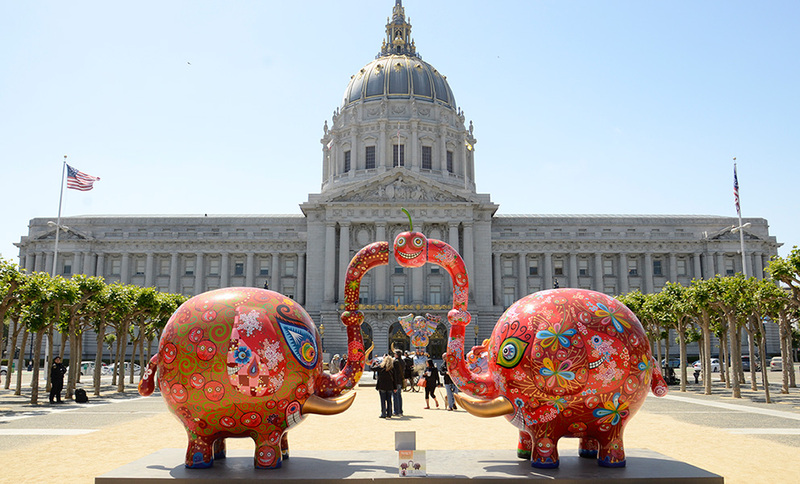 The Arts Commission must approve the temporary or permanent installation of any work of art on City and County of San Francisco (CCSF) property, or any proposal funded in whole or in part by City funds (regardless of its proposed location). This includes proposals initiated or funded by other City departments, or by outside sponsors, such as individual artists, organizations or commercial enterprises. In considering approval, the Arts Commission must evaluate proposals within the context of its mission to promote a rich, diverse, and stimulating cultural environment for the city’s residents, visitors and employees, and to enhance the city’s image both nationally and internationally. Below are the steps necessary for obtaining Arts Commission approval for a temporary installation of artwork on CCSF property or funded by CCSF. Note: With the exception of funds awarded on a competitive basis through its various programs, the Arts Commission cannot provide financial or staff support for the project. It is incumbent on the project sponsor to cover all costs associated with the project. There should be a compelling reason to site the exhibition on City property, such as the relevance of the exhibit within the natural, architectural, cultural, historical, social/political or environmental context of the site. Artwork should, have merit as a work(s) of art, independent of other considerations. The exhibition of the artwork should be judged to enhance the public’s experience of the site. The exhibition should be an opportunity to expose the public to diverse artists and artistic styles. The exhibition should not contradict the City’s values of environmental sustainability, accessibility, and cultural inclusiveness. Exhibitions proposed should be appropriate in scale, media and context with its intended display location. There is evidence that the exhibition has community support. The artwork should be judged to be able to withstand unprotected display in an outdoor environment, and be able to be maintained by the sponsor throughout the public display period. The exhibit must not present a safety hazard. It must comply with all applicable building codes and disability access requirements. The proposed exhibit must be evaluated to be feasible, with convincing evidence of the sponsor’s ability to mount the exhibit as proposed. Factors to be considered include, but are not limited to: project budget, timeline, the artist’s experience, soundness of materials, The proposed exhibit must not impede the typical uses of the site. Project sponsors must be willing to pay all costs associated with the exhibit, including any Arts Commission staff time involved in assisting the sponsor with the exhibit, any required insurance, and permit fees. The Arts Commission must hold art installations proposed for the Civic Center environs to the highest standards due to the close proximity to City Hall and by association, identification with the standards and values of CCSF. In considering approval of proposed installations, the Commission should apply the criteria below. There should be a compelling reason to site the exhibition in the Civic Center complex, such as the relevance of the exhibit within the architectural, cultural, historical, social/political or environmental context of the site. Artwork should be of representative of highest aesthetic standards, and have merit as a work(s) of art, independent of other considerations. The exhibition of the artwork should be judged to enhance the public’s experience of Civic Center, and enhance the city’s cultural profile and prestige. The exhibition should be an opportunity to expose the public to diverse artists and artistic styles. exhibitions in the Civic Center environs should not only emphasize Bay Area artists, styles and movements, but also present the work of artists nationally and internationally so that local culture may be seen within a global context. As the exhibition may be seen to reflect on the entire Civic Center complex, project sponsor must provide the Commission with evidence of community support, including that of the Mayor’s office, Main Library and Asian Art Museum. The artwork should be judged to be able to withstand unprotected display in an outdoor environment, and be able to be maintained by the sponsor throughout the public display period. The proposed exhibit must be evaluated to be feasible, with convincing evidence of the sponsor’s ability to mount the exhibit as proposed. Factors to be considered include, but are not limited to: project budget, timeline, the artist’s experience, soundness of materials, City approval requirements, and level of community support. The proposed exhibit must not impede the typical uses of the site. Project sponsors must be willing to pay all costs associated with the exhibit, including any Arts Commission staff time involved in assisting the sponsor with the exhibit, any required insurance, permit fees. Sponsor shall be required to indemnify the city against any and all claims that may arise as a result of the installation. Determine the owner of the property you have selected for your installation site. Will your project take place on city property or private property, or public property under the jurisdiction of another governmental agency? Determining this is the responsibility of the project sponsor. Arts Commission staff cannot assist in identifying a location for the installation. Public property is defined as any property under the jurisdiction of a governmental agency; i.e. city, county, state and federal agencies all oversee property. City property is defined as property under the jurisdiction of the City and County of San Francisco (CCSF). Different agencies have jurisdiction over various properties; i.e. the Recreation and Park Department has jurisdiction over all parks and open space within the city, San Francisco Public Works has jurisdiction over sidewalks and public right of ways, etc. For temporary projects on public property, you will need permission from the agencies and departments that have jurisdiction over the property as well as the Arts Commission. Please note that usually, agencies cannot provide financial support, maintenance or staff support for any aspect of a project. Private Property is defined as any property owned by a person or entity other than a governmental agency. To determine the owners, department or agency responsible for any property, and to obtain information about permitting, please review the San Francisco Planning Department’s Property Map. Visit the Planning Department's website for more detailed contact information. If your project will take place on private property, and is not funded by the City, you do not need approval from the Arts Commission. If your project will take place on City-owned property, or if it is funded by City funds, regardless of its location, the project must be approved by the Arts Commission. If either of these conditions is true, please proceed to Step Two. Completed Temporary Public Art Proposal Form. Letter of approval from the City agency having jurisdiction of over the site, or the property owner if project is funded by City funds. Three letters of community support. Brief narrative description of the proposed project. Please address the intent of the artwork and how it relates to the site. Scale drawing or model of the proposed project. Budget, including the funding source for the project. Timeline, including dates of installation and deinstallation. Resumes of all artists involved. Signed Waiver of Proprietary Rights for Artworks Placed on City Property or Private Property. Your proposal will be reviewed by Arts Commission Staff. You may be asked to meet with staff to further explain or clarify your proposal. A proposal for temporary installation or exhibition is first reviewed by the Arts Commission’s Visual Arts Committee, a subcommittee of the full Arts Commission. This committee meets on the third Wednesday of each month at 401 Van Ness Avenue, Room 125, San Francisco, CA 94102. If the proposal is approved by the committee, the item will be placed on the agenda for the Full Arts Commission for approval by Resolution. Arts Commission approval is complete when the Full Arts Commission approves the temporary public art project by Resolution. The Full Arts Commission meets on the first Monday of each month at San Francisco City Hall, Room 416, more info. Installations lasting less than 7 days may be approved by the Director of Cultural Affairs and do not need to be calendared for approval by resolution of the Commission. Installations proposed for San Francisco International Airport: The Arts Commission will not approve installations proposed for the San Francisco International Airport. The Airport has its own exhibitions program and curatorial focus. Artists interested in this venue must contact Blake Summers at the Airport Museums program.